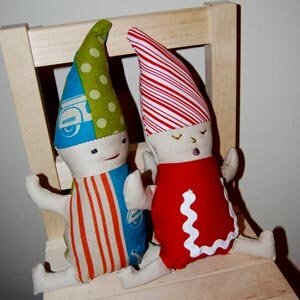 This free Christmas elf pattern is customizable depending on the fabrics you use and is a cute toy all year round. Use red or green fabrics to make one that is cute enough for holiday decor as well as something cute, cuddly and festive to put in a stocking for a little one. 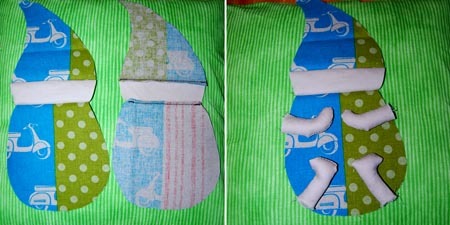 This is a very simple project to sew once you have your pieces cut out. The toughest part is picking the fabrics to use. 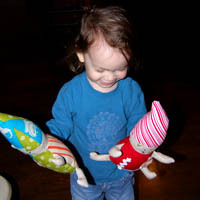 This elf pattern is a template, this means that you might want to add on your seam allowance around the arms and legs. 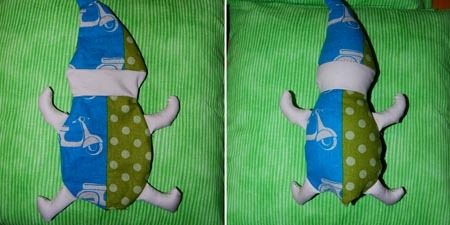 In the example photos shown I didn't add a seam allowance, but adding one will make sewing the arms and legs easier. For stuffing you can use wool, bamboo, cotton, ecofill, polyfill or even cut up fabric scraps. You can partially fill with beans or rice to give a heavier weight, but this is not recommended for children under the age of three or children who are rough on their toys or you'll have a giant mess later. If you really want to weight your elf you can also sew a little fabric packet filled with rice or beans that you slip inside of it, this will give an added layer of no spill protection. Here is the free elf pattern PDF for the hat and face and here is the free elf body, arms and legs pattern PDF to download. As with all of my free patterns, you may use them for your personal use, but not for items to sell. First, cut out your pattern pieces and sew the front panel and the back panel as well as the legs and arms. Turn the arms and legs right side out and stuff them. Take your front panel and figure out where you want the arms and legs to to and then put them facing in on top of your front panel. Pin and sew the arms and legs in place, pointing inward as shown. Next, lay the back panel on top of your front panel with the arms and legs sew onto it, right sides facing together, pin and then sew. Remember to leave an opening to turn your elf doll right side out. Turn the elf pattern right side out and stuff. Sew up the hole that you used to to turn and stuff. Now choose how you'll finish the face. If you are making this as a decor item, buttons for eyes are pretty frickin' adorable. For a young child though, embroidery is always the safest bet, which is what I went with since there is no way I can keep these out of the hands of my little one. Some I did with a simple smiling face and others I made singing! All done! You might also want to have fun and get creative with accessories for your elf. You can see I added a pocket to the red Christmas elf, which is fantastic for holding a candy cane! (I sewed on the pocket first before putting the panels together) Other ideas are bells or tassels on top of the hat and a little tree that is just their size would be pretty adorable too. Last, but not least, give it to a child to love!